(Photo: REUTERS / Tony Gentile)Pope Francis kisses a foot of a disabled person at the S. Maria della Provvidenza church in Rome, during the Holy Thursday celebration, April 17, 2014. Pope Francis visited a rehabilitation center at the church, on Rome's outskirts, for a service in which he washed and kissed the feet of 12 sick and disabled people. VATICAN CITY (Reuters) - Pope Francis, starting four packed days culminating in Easter, said the Catholic Church must always be a refuge for the needy and later washed the feet of 12 disabled people at a traditional Holy Thursday ceremony. In the morning, Francis, who regularly urges priests to shun material comforts or the desire to climb clerical career ladders, led the first of two solemn services on the day that Christians commemorate the founding of the priesthood by Jesus. In the grandeur of St. Peter's Basilica, he celebrated a "Mass of the Chrism" during which he and priests renewed the vows they took on the day of their ordination and he blessed oils to be used in administering sacraments during the year. At the mass, attended by some 10,000 people and accompanied by a pontifical choir, he delivered a sermon on the need for priests to live a simple, poor life. He described the Church as "a house with open doors, a refuge for sinners, a home for people living on the streets, a place of loving care for the sick, a camp for the young, a classroom." Holy Thursday commemorates the day on which Catholics believe Jesus founded the priesthood at the Last Supper with his apostles, before he was betrayed and arrested on the eve of his crucifixion. In the afternoon, the Argentine-born pontiff travelled to a Church-run rehabilitation centre on Rome's outskirts for a service where he washed and kissed the feet of 12 sick and disabled people, in commemoration of Jesus' gesture of humility towards his apostles on the night before he died. The 12 ranged in age from 16 to 86 and included four women and a 75-year-old Muslim man, Hamed, a Libyan businessman who suffered severe brain damage in a car accident. Francis delivered a short, simple sermon to the participants, some of whom were shaking in their wheel chairs. "In our hearts at this moment, let each one of us think of the other ... and how we can each help each other," he said in the institution's modern chapel. Previous popes always held the ceremony either in St. Peter's Basilica at the Vatican or Rome's Basilica of Saint John Lateran and only included 12 Catholic men - usually priests - at the service. But Francis, continuing a tradition he started when he was archbishop of Buenos Aires, holds it in poorer neighbourhoods with ordinary people as a sign of his desire for the Church to be closer to the suffering and the needy. 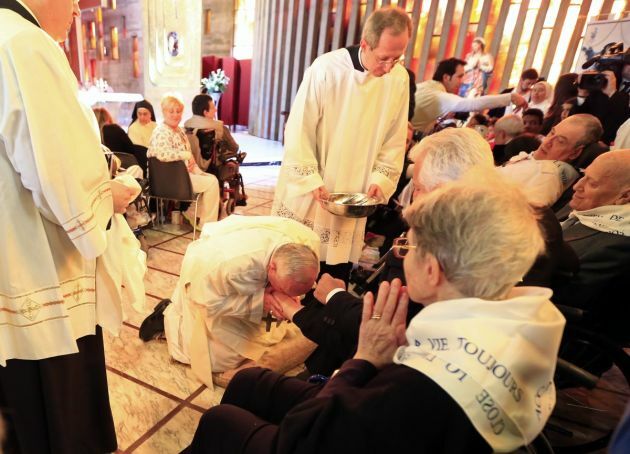 Last year he held it in a juvenile jail and washed and kissed the feet of women and Muslim inmates - the first time a pope had made such a gesture, sparking criticism from ultra-traditionalist Catholics. On Good Friday and Holy Saturday Francis presides at three services leading up to Easter Sunday, when he delivers his "Urbi et Orbi" (to the city and the world) blessing and message. On Sunday, April 27, Francis canonises Pope John Paul II, who reigned from 1978 to 2005, and Pope John XXIII, who was pontiff from 1958 to 1963 and called the Second Vatican Council, a landmark meeting that modernised the Church.